Not much to say about it. It's a perfect fit for my 9mm double stack mag. And the flash light compartment fits my Sure 6P like a dream. I would definitely recommend this item to anyone. The most comfortable paddle holster I've ever had. 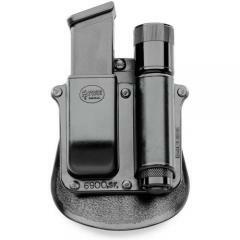 I use it in conjunction with my Fobus paddle holster for my Glock 23. Great product, highly recommended.